One of the biggest issues for truck drivers in 2018 will be the enforcement of the ELD mandate. January 18th will mark one month since the law has required truck drivers to have an electronic logging device (ELD) in their vehicle which is meant to ensure that drivers follow their regular hours of service. We are collecting responses regarding this new mandate from the truck driver community and other trucking industry professionals. Did you find it easy to switch to ELDs? How has this affected your salary? Do you believe this mandate has made the roads safer? Has the mandate changed how you plan your trips work with your dispatcher? To share your experience please register and post in the ongoing discussion at the Class A Drivers forum HERE. OR you can email: michael.sarrow (at) internetbrands.com to have your voice heard! Next week we will follow up with an article full of reactions and concerns from truck drivers about the ELD mandate. If you don’t already know about ELDs and this new regulation then this is the article for you. We’ll run down what the mandate is who’s exempt and what you should do to follow the new rules. An ELD (electronic logging device) connects to a truck’s engine to record data. An interactive user screen gives the driver the ability to input or edit work-related data including the driver’s Hours of Service. ELDs are especially designed replace the manual work of using paper pen and a logbook. Using the data gathered by the ELD trucking companies can also monitor driver performance through the use of fleet management software. 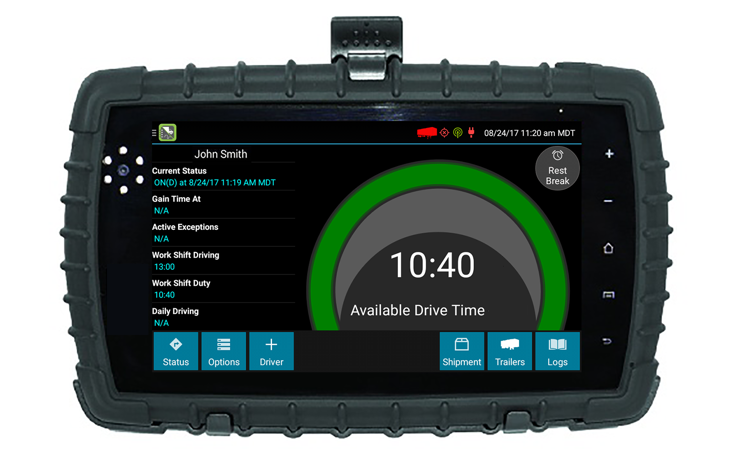 ELDs are now mandated to be included in trucks by the FMCSA (Federal Motor Carrier Safety Administration) and the DOT (Department of Transportation) to enforce driver Hours of Service. The passing of this regulation has been highly controversial. The FMCSA argues that ELDs are needed because truck drivers using paper logs routinely violate the Hours of Service. The regulations are also designed to reduce driver fatigue and commercial vehicle accidents. In response to the mandate a group of drivers and industry professionals organized behind the name “ELD or Me” (also #ELDorME). They are fighting against the mandate because of privacy concerns. #ELDorME backed a bill (HR-3282) to delay the regulations but that effort did not succeed. How Will Truck Drivers Be Affected? The ELD mandate will affect all parties involved in the supply chain. Many drivers are opposed to the ELD mandate because of the nature of truck driving. If ELDs enforce more rigid schedules many truck drivers are concerned the roads will become less safe as drivers rush to meet deadlines. The ELD mandate may remove the ability of truck drivers to be more flexible with their time which creates a need for precision timing that may not always be realistic. Long delays are a fact of life for drivers and many are forced to wait without being paid as their trailers are loaded and unloaded at shippers/receivers. Drivers also have privacy concerns about a device that can measure every last detail about their vehicle and working life. While the concern for micromanagement is valid drivers may benefit from having current logs and significantly less paperwork. What About Owner-Operators and Trucking Companies? Owner-operators will incur costs for installation and maintenance of the device as well. All trucking companies large and small will encounter these costs in addition to costs related to potential driver detention pay or additional staffing that may be needed. For large companies however certain benefits may outweigh these costs. ELDS will transfer real time fleet data provide up-to- minute delivery tracking facilitate faster roadside inspections for compliance provide alerts in advance of potential engine problems or maintenance issues and maintain valuable information for legal issues. With the ELD Mandate Truck Drivers Need to Manage Their Time. 2018 is the year when truck drivers will be forced to deal with the major implications of the new mandate. Drivers trucking companies and even shippers/receivers will need to work together to comply with stricter Hours of Service enforcement. Proper scheduling and trip planning are keys that can offset time flexibility issues. Pre-loading more trailers will create drop-and- hook alternatives for drivers to maximize their hours. Ample parking will need to be provided by shippers as well as local governments so truckers can stop and comply with strict 10-hour break regulations. In 2010 the FMCSA proposed rules to require truck and bus companies with poor safety and compliance records to install electronic onboard recorder devices. The OOIDA (Owner Operators and Independent Drivers Association) responded by filing an appeal against the FMCSA’s rule that was upheld by the 7th US Circuit Court of Appeals. The appeal stated that the 2010 EOBR (Electronic Onboard Recorder Device) final rule did not protect truck drivers from potential harassment by their employers such as forced dispatch when a driver decided to rest. The court returned the rule to the FMCSA for further considerations. During the FMCSA’s re-examination of the rule the US Congress established the Moving Ahead for Progress in the 21st Century Act (MAP 21) in 2012. MAP-21 is a funding and authorization bill to govern United States federal surface transportation spending. It was passed by Congress on June 29 2012 and was signed by President Barack Obama on July 6 2012. This law orders all carriers to have ELDs installed in their vehicles. AOBRDs installed before 12/18/2017 (a grandfather clause) but must be able to print a compliant paper log on demand to enforcement officers. Drivers that only operate 8 days out of a 30-day period. Tow-away or drive-away drivers that transport empty vehicles intended for sale lease or repair as long as the vehicle they are driving is part of the shipment. The driver must operate within a 100 air-mile radius of his/her normal work reporting location. 150 air-mile radius Section 395.1(e)(2) This is for Commercial Motor Vehicles (CMVs) that do not require a Commercial Driver’s License (CDL). To qualify the driver must operate within a 150 air-mile radius of the normal work reporting location and return to the normal work reporting location at the end of each duty tour. For the majority of company drivers and owner-operators though there is no exemption. Please remember to comment at our forums or email michael.sarrow (at) internetbrands.com to share your experiences with the new mandate. In our next article we’ll discuss the arguments for and against the new mandate and provide opinions straight from the community of drivers.